This tutorial provides you with a foundation for working with correcting color in Adobe Photoshop Elements. It is the fifth lesson in the Adobe Photoshop Elements 10 Digital Classroom book. Sometimes adjusting the tonal range brings out a color cast in an image. A color cast is an undesired color shift in a photo. For example, a photo taken indoors with a flash might contain more blue than it should. In Lesson 3, “Fixing Common Photographic Problems,” you removed a color cast automatically. In this exercise, you’ll have more control over the process as you remove a slight blue cast from your image in Full Edit. You can make color and tonal adjustments in the Color Variations dialog box by comparing and choosing different thumbnail variations of the photo. You can’t use the Color Variations command with images in Indexed Color mode. 1 Choose Enhance > Adjust Color > Color Variations. The two preview images show the original image (Before) and the adjusted image after you’ve made changes (After). 2 Select Midtones in section 1 to choose the area of the image you want to adjust. 3 Drag the Adjust Color Intensity slider in section 2 to control the intensity of the adjustment that you’ll make when clicking a button in section 3. Dragging the slider to the left decreases the amount of adjustment, and dragging to the right increases the amount of adjustment to be applied. Drag the slider slightly to the left. 4 Click the Increase Red button in section 3 to warm the image and remove the slight blue color cast. Each time you click a button, the After thumbnail is updated. Use Color Variations to compare and choose adjustment options. 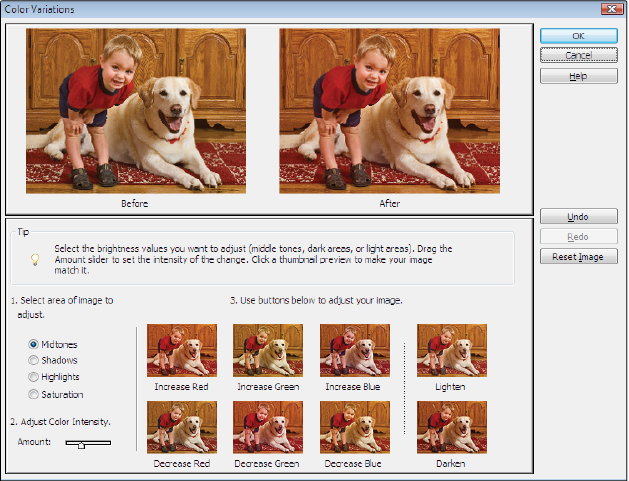 5 When you’re satisfied with the results, press OK to apply the adjustments to your image. 6 Choose File > Save. Keep the image open as you will use it again in the next exercise. As you become more comfortable with color correction and the RGB color model, you might want to try selectively editing channels using Levels. 1 Choose Enhance > Adjust Lighting > Levels. 2 Choose a color channel to adjust from the Channel pop-up menu. In this exercise, you’ll choose Green to remove green from (and add magenta to) the image. 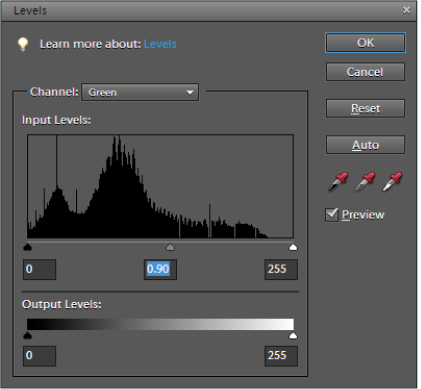 The Levels dialog box allows you to remove a color cast by adjusting individual color channels. The Adjust Color Curves command adjusts highlights, midtones, and shadows in each color channel of an image. You can also compare and choose different tonal presets by selecting from the list of styles in the Select a Style box. 1 In the Editor workspace, confirm that Bobby and Elvis_work is still open and visible. 3 Choose Enhance > Adjust Color > Adjust Color Curves. 4 In the Select a Style box, choose Default as the type of adjustment to apply. 5 Experiment by dragging the Adjust Highlights, Midtone Brightness, Midtone Contrast, and Shadows sliders. Note the changes in the tone curve to the right of the sliders. 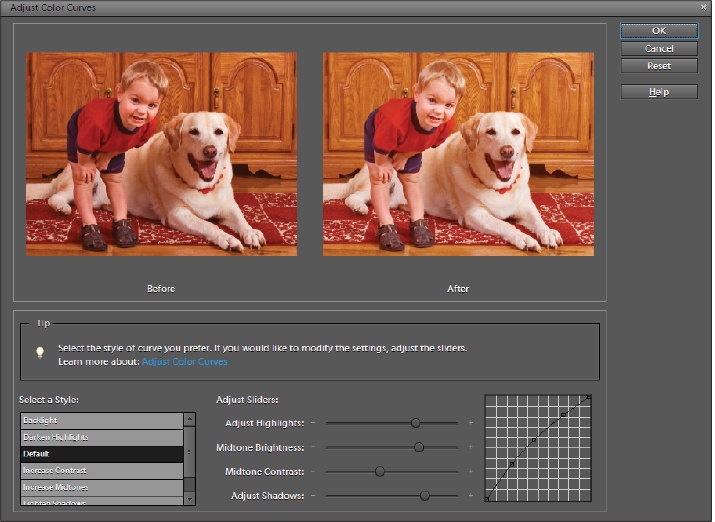 Adjust Color Curves automatically adjusts tonal range in each color channel of an image. 6 When you’re satisfied with the adjustment, apply the adjustment by pressing OK.